This is where friendships are forged, fire and flavor come together, and new techniques are perfected. 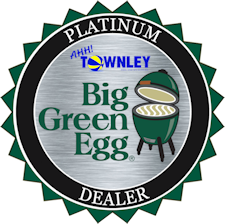 The most versatile grill you’ll ever own, the Big Green Egg, comes with a lifetime waranty! Of course, with the versatility of the EGG, you can Grill, Roast and Bake … but cooking for longer periods of time over low heat infused with wood smoke is what Smoking – and what some call “real barbecue” – is all about. Need a grill of your own? Thinking about playing with fire? Contact us today! May is National Barbecue Month! It’s the time of year that celebrates the beginning of the “official” grilling season (even though many of you grill all year long)! In this article, we look at the history of Barbecue Month and how to celebrate it. The Big Green Egg was the star of the hunt! Owner, David Townley, took the Big Green Egg MiniMax and cooked sausage for more than 75 people on this small, but mighty powerhouse! Check out the event slide show! The Spring Camp Out for Cub Scout Pack 30 was fun for all and allowed the boys a chance to get their final qualifications before graduating to the next rank.